Earlier this year, when I realized how many of my quilts were never shared here on my blog, I made a soft goal of having them posted by the end of 2018. As November comes to an end, I can see that my soft goal was too ambitious. So my new goal is to finish my quilts from 2014! After this post, I only have two left, so I hope that's a reasonable goal! On to my 36th quilt, which I called Avocado Ties. The inspiration for this quilt began when the leader of our local quilt group mentioned that we needed more quilts for guys. I looked through the fabric bins at church and found this retro tie print. Hello 70s! Blue would have been my first choice for coordinating prints, but I found more browns and avocado green prints in the stash, like this cool geometric print. I was destined to embrace colors of days gone by! For a pattern, I made a variation of a rail fence, with the center stripe being wider than the outside two. It's a nice quick pattern which I may need to revisit again when I want to make some quick quilts or feature certain prints. Because it was a quick and easy quilt, I didn't take a lot of pictures, but I did notice that when I was laying out this quilt, I didn't yet use my laundry room design wall. Instead, I was using the Cheryl Ann portable design wall that I bought at Quilt Festival in Houston. It's pricey, but great for travel and bigger spaces than the narrow space I have. 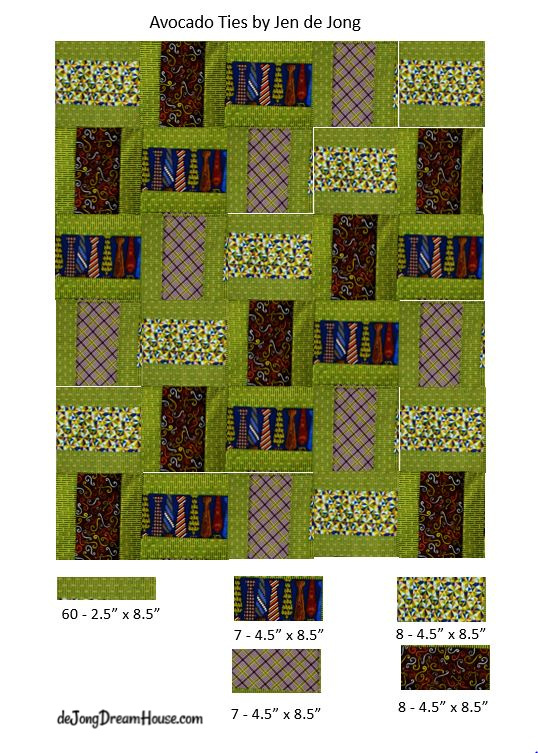 I actually donated it to Janice of Quilts of Compassion this year because I know she can put it to good use as she works with different quilt groups. 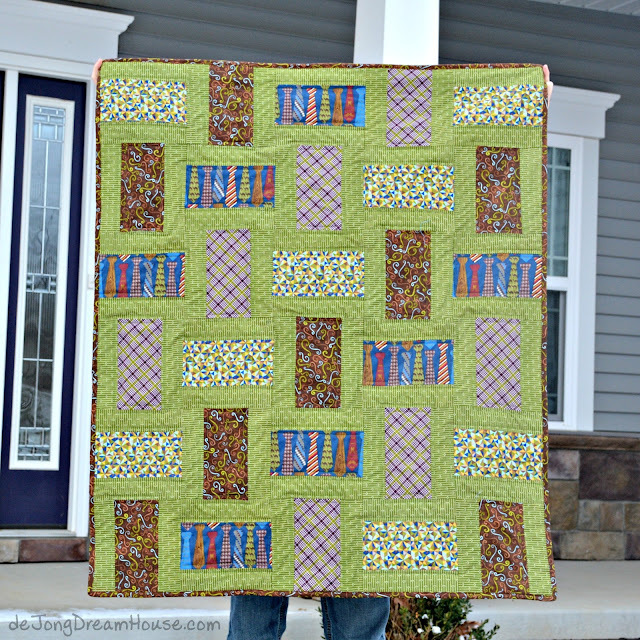 The other quilty toy I used when making this quilt was this pair of Dritz quilt hangers. They are really handy, but I started taking quilt photos outside so now I'm not even sure where they are! The last noteworthy bit from this quilt is that I learned to blanket stitch. I didn't take a photo of the label, but I think I put it on top of this heart. As with so many comfort quilts I've made, I don't know exactly where this quilt ended up. I believe it was distributed to an assisted living facility here in Ohio, but I'm not certain. Wherever it is, I hope that it is being used and loved. With that, I only have two 2014 quilts left to share! You can see a list of all the quilts I've made here (with links where available), and see photos of all my quilts here. To see what I'm currently working on, follow me at dejongdreamhouse on Instagram. Love the Avocado Ties quilt. Im going to try to make one just a bit bigger to donate to the fire victims in Paradise, CA. Thanks for sharing. I love that tie print and you certainly made the best use of it with the avocado fabric. WhenI was first married, way back in the sixties, my kitchen had an avocado refrigerator, stove, dishwasher and floor with yellow walls. Can you imagine but we thought it was very cool back then. I'm sure that someone will love your quilt and how very generous of you to donate it. It was quite trendy back in the day! My mom's bridesmaids had avocado green dresses, and in addition to the avocado green appliances, she and dad had a bedroom filled with matching avocado prints: bedspread, curtains, and fuzzy wallpaper! I wish I had a picture! When I was little I thought it was a jungle! Lovely quilt, I love this geometric fabric too! The green background is perfect! What a fun quilt. So many unique fabrics, and the avocado ties them all together beautifully. What a quick quilt to make! I bet whoever got it loves it. Perfect for a guy. Thanks for sharing on Wednesday Wait Los. Thank you for sharing the size of your blocks. I had something similar in mind for my local dog shelter fundraiser. I hope to donate it next year.